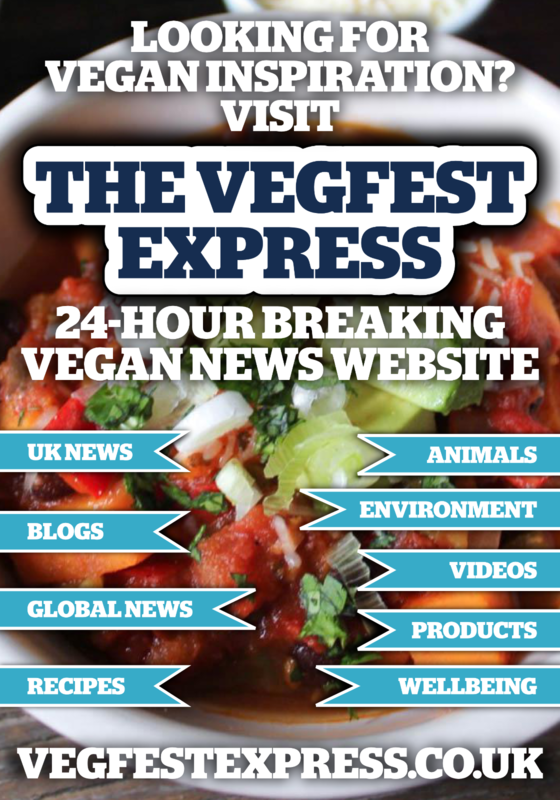 Happy New Year from the Vegfest Express - Dec 2015 bulletin/roundup is here! 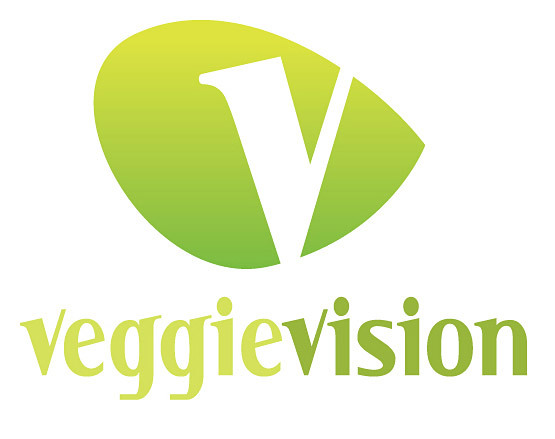 Happy New Year to all followers of VegfestUK who have supported us in 2015 and many years before that! We hope all of you have had a marvellous festive break full of sumptuous vegan food and drinks, and in making more vegan choices we get ever closer to ending animal exploitation altogether. A belated bulletin from December 2015 is here with highlights from the last month of the year just gone - we wish everyone a marvellous 2016 ahead. 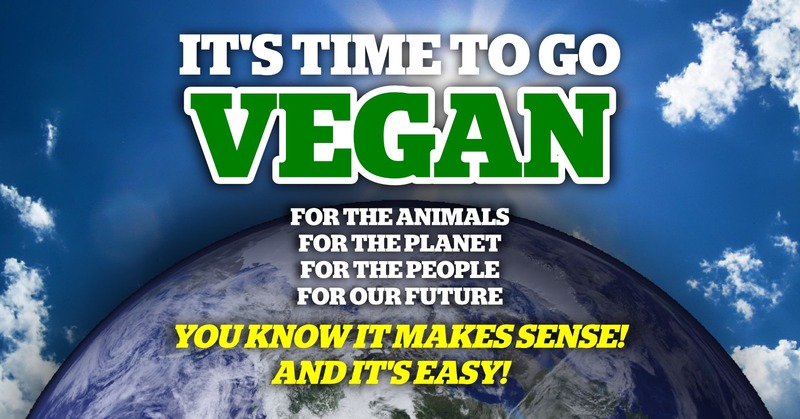 If you are not yet vegan, please consider going vegan - it is really easy, the animals will thank you profusely, let alone your own bodies, the environment and the numerous human beings who need food and water to survive! 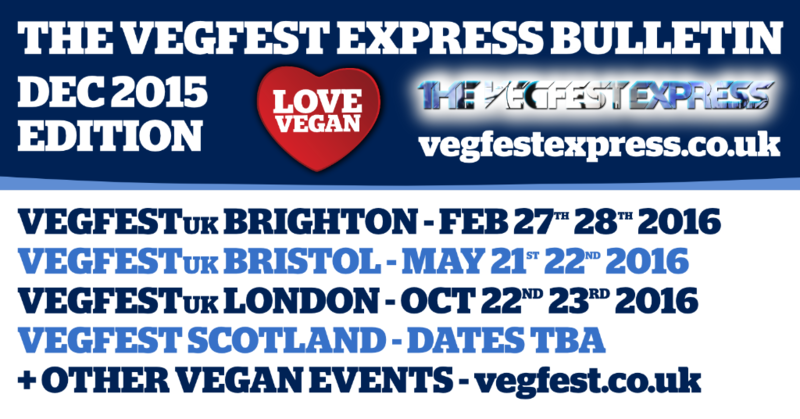 Many thanks to those of you who have purchased your advance tickets for VegfestUK Brighton 2016. Our BUY ONE GET ONE FREE offers for advance tickets are now over and these are now on BUY ONE GET ONE HALF PRICE till January 31st 2016. Advance tickets are £7 a day and £10 for the weekend, plus small bookings fees. Vegfest events tend to be busy with very limited tickets on the gate (subject to availability). 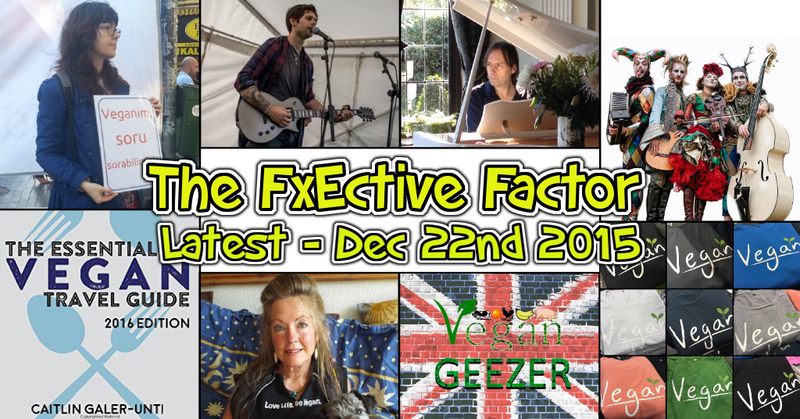 Aapplications for performing/speaking slots at the brand-new FxEctive Factor – vegan X Factor – are hotting up quickly! We’ve got a range of amazingly talented musicians and innovative vegan activists showcasing their chosen forms of vegan outreach at this new feature, with the aim of inspiring vegan activists worldwide to come up with creative, peaceful forms of vegan education. 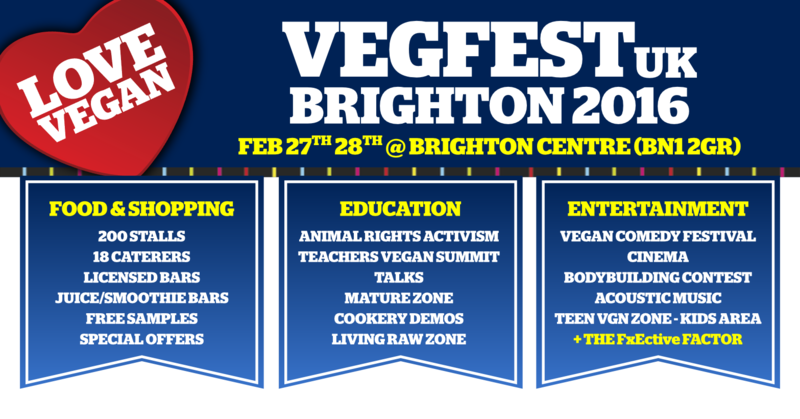 VegfestUK is committed to encouraging and supporting teachers to educate children on ethical, health and sustainability issues and that’s why they have introduced a Teachers Vegan Summit at VegfestUK Brighton to complement other Vegfest summits for Health and Sports professionals. 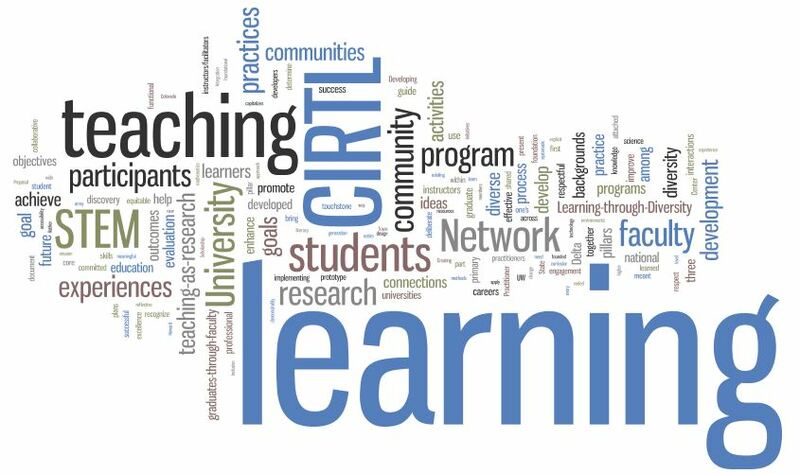 Teacher, researcher writer Dylan William says that every teacher fails every day and there is always room for improvement. 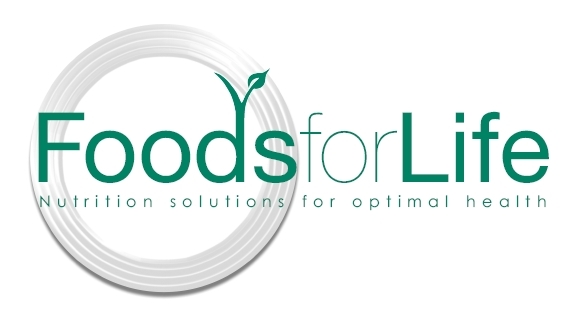 VegfestUK founder Tim Barford says that teachers can’t credibly call themselves an evidence informed practitioner if they haven’t investigated the many solutions that veganism offers for health, the environment and ethical and social development. Big big thanks to everyone who visited our first-year show up in Glasgow SECC on December 5th 6th 2015. 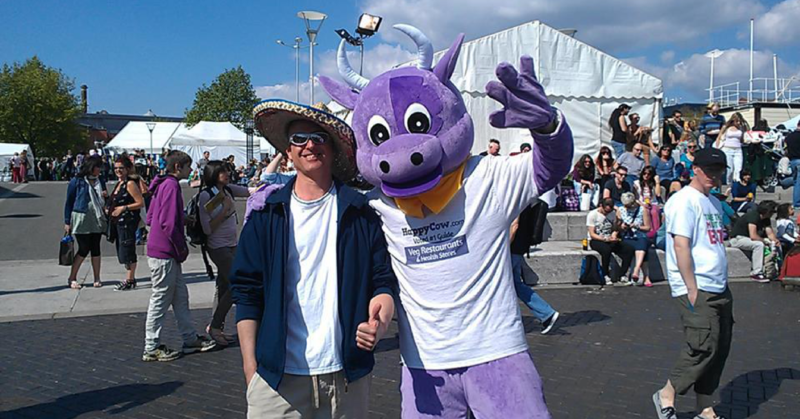 The event was a brilliant one with 7,500 people overall! 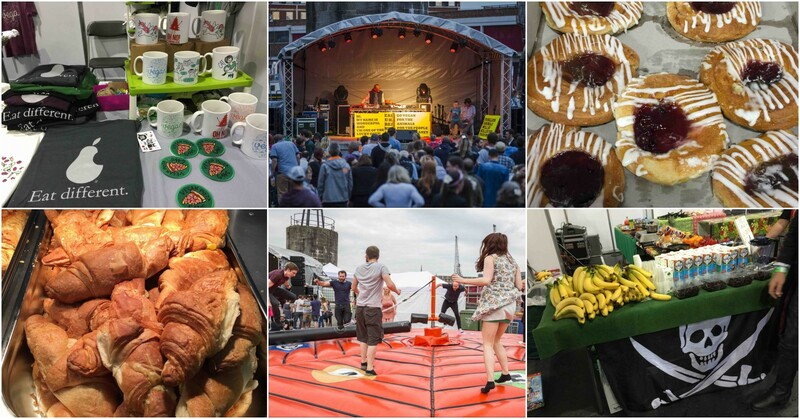 We are truly humbled to have hosted a Vegfest on Scottish soil for the very first time and also the amazing reviews that we've received ever since. Dr. Doug Graham speaks on "Many conditions with one common consideration"
The Big Discussion: Should Vegans promote the REDUCETARIAN approach? Singer/songwriter Jack Dean performs new single "Do You See"
Pig Freud has raised in excess of £3,600 during his Autumn Tour! 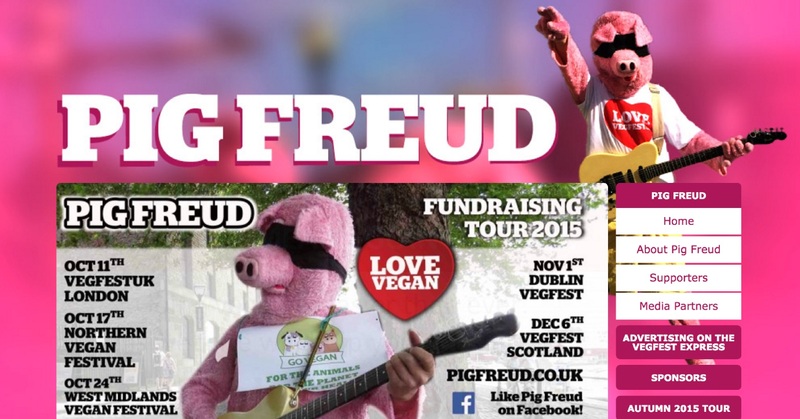 Many many thanks for everyone who has supported the Pig Freud Tour 2015. The Crowdfunder has now closed, and the Pig has raised an incredible total of £3,644!!! Pig Freud is duly humbled, and most most grateful for your help in achieving this fantastic total. To all our supporters, stallholders, speakers, visitors, contractors, venue staff, and all the people we want work and engage with: Wishing you the very best for 2016 – a massive thanks for all your help and support in 2015. 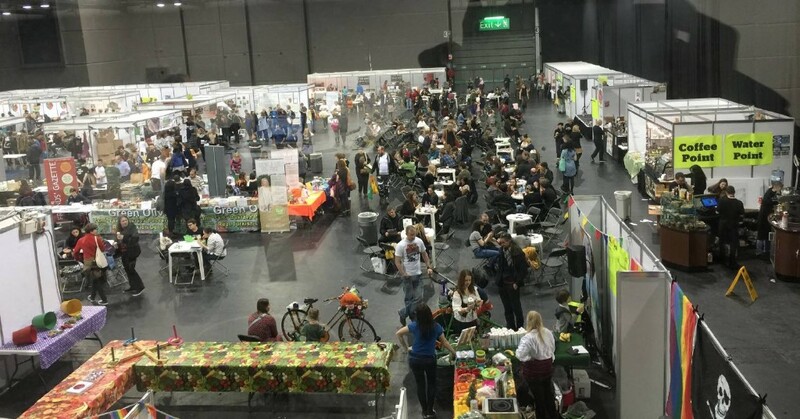 VegfestUK has seen a massive growth over the last two years especially, and we now have 4 shows each year, all of them close to or already on capacity for stalls, speakers and visitors. We have shows in Brighton (Feb 27th 28th), Bristol (May 21st 22nd), London (October 22nd 23rd) and Glasgow (Dec 3rd 4th TBC). For 2016, we are clarifying our criteria for our events, especially regarding the vegan factor, so that everyone can evaluate a little easier. Tim Barford spoke for 30 minutes recently on the Species Barrier Radio show about some of the changes that have occurred within VegfestUK and the UK Vegan movement during the last year or so. Tim speaks eloquently, calmly and insightfully as he looks especially at the rise of abolitionist thinking within the UK right now. In our society where animal exploitation is so pervasive and normative, it can feel a rather lonely place for vegans who take an unequivocal non-exploitative stance towards all animals. 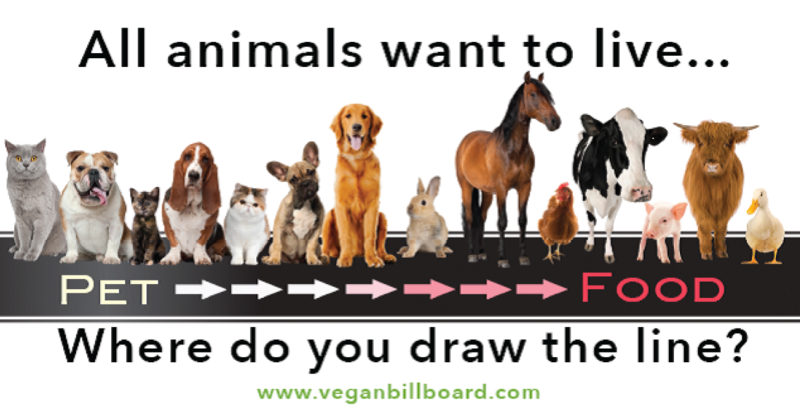 How should we start a conversation with someone who is not yet vegan? How can we engage their interest and challenge the existing paradigm of 'animals as property', and invite them to think of animals as persons rather? How could we convince them that veganism is a moral obligation for the animals if they care about animals morally? Koko Dairy Free is a delicious coconut-based alternative to cow's milk and soya milk. Low in fat (only 2%) and rich in calcium, as well as being cholestorol free Koko Dairy Free is a fantastic healthy option for people of all dietary persuasions. Additionally, the coconut is not a nut but is actually a fruit, making Koko Dairy Free a nut free product and therefore suitable for people with nut allergies, which is amazing. At VegfestUK, you'll also have the opportunity to taste the new Strawberry ‘milk' flavoured with real strawberry juice, and available in 250ml packs. Bute Island Foods are thrilled to be back for another year at VegfestUK with their 100% dairy-free products. Melty Red Cheddar and Mild Cheddar styles are perfect for melting onto pizza, pasta and of course Sheese on toast! Also, don't miss out on the Sweet Chilli flavour which is deliciously smooth and creamy, with a mild, yet cheekily well-balanced hint of spice! Bute Island's Vegandeli vegan mock meat has also made waves since its launch in 2013. The Flying Duck is more than a bar-club. Within the confines of their walls, you can find sumptuous food and drink, of course. All their food is 100% vegan and free from animal produce and they’ve been working hard to provide a decent whack of gluten-free options too. The Flying Duck have added some new drinks to their already pretty decent selection. Expect a host of new wines for you to sip your way through, some simply to die for small batch gins and the latest flavoured ciders to hit bars, Blind Pig. 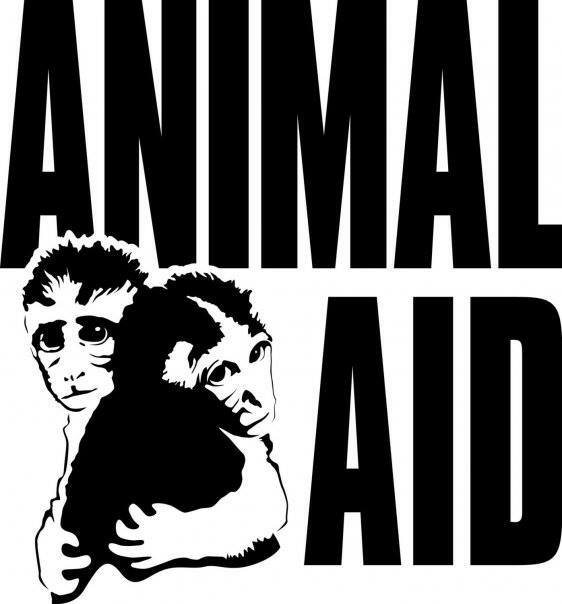 Animal Aid campaign peacefully against all forms of animal abuse and promote a cruelty-free lifestyle. They investigate and expose animal cruelty, and their undercover investigations and other evidence are often used by the media, bringing these issues to public attention.